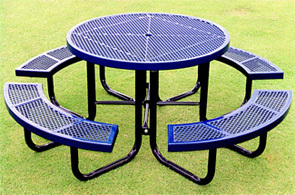 Round picnic tables make it fun to eat outside with friends and family. 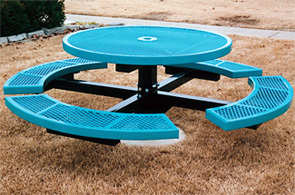 3/4" #9 gauge expanded steel make up the circular table top and seats, and are coated with a thermoplastic coating to prevent corrosion and minimize maintenance. Solid table tops are also available. 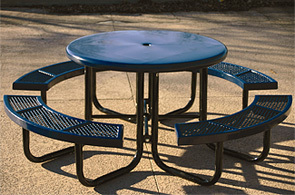 The 46" diameter table top provides ample space for food and drinks, and come standard with a 2" umbrella hole. 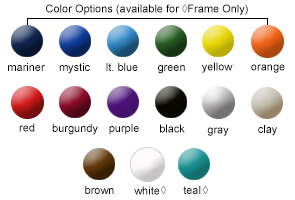 Optional umbrella comes in two standard sizes and various colors. Thermoplastic coated table top and seats are finished with a lightly textured matte Polyethylene coating in the color options shown. Portable, in-ground, and surface mounts are all powder-coated in the color of your choice.